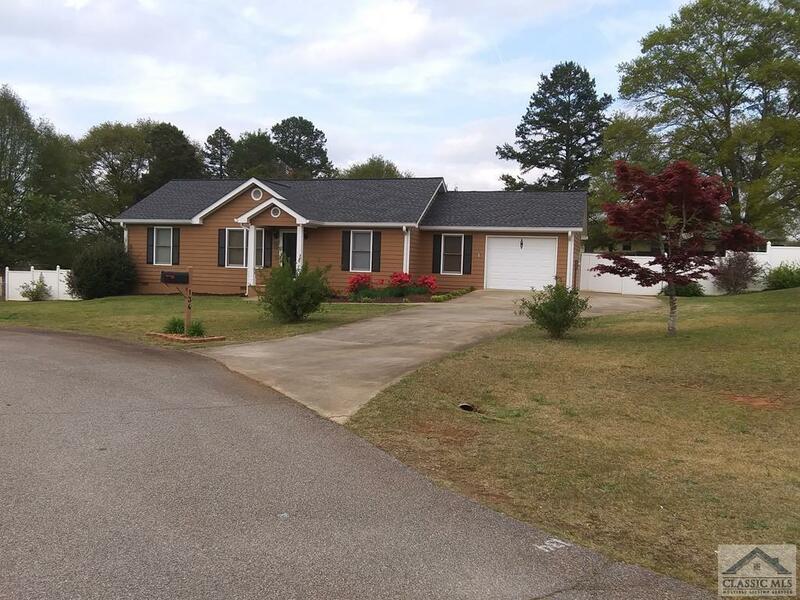 134 Northridge Place, Danielsville, GA.| MLS# 968384 | Athens. Athens Realtor. Athens Georgia Realtor. Athens Homes for Sale. Athens Georgia Real Estate. Athens Area Real Estate. Athens Real Estate. Moving to Athens. New home Athens. PERFECT SPLIT BEDROOM RANCH PLAN WITH VAULTED GREAT ROOM W/ WOOD LAMINATE FLOORING. NEW VINYL IN KITCHEN, BEAUTIFUL STAINED GLASS OVER KITCHEN SINK. NEARLY NEW APPLIANCES INCLUDING FRENCH DOOR REFRIGERATOR AND TWO NICE SIZE PANTRIES WITH W/D CONNECTIONS EASY ACCESS OFF KITCHEN. VERY LIVABLE HOME. TOTALLY FENCED BACK YARD FOR KIDS OR PETS. WONDERFUL 12X15 COVERED CONCRETE PATIO AND A VERY HANDY OUTSIDE STORAGE BLDG. BEAUTIFUL AND WELL DONE LANDSCAPING W/ SEVERAL JAPANESE MAPLES AND OTHER ORNAMENTAL TREES AND PLANTS. ROOF & GUTTERS ONLY 2 YRS OLD. HOME IN EXCELLENT CONDITION, READY TO MOVE IN. SINGLE DOOR GARAGE BUT EXTRA SPACE FOR WORKSHOP OR HOBBIES, WITH PEG BOARD FOR ORGANIZATION. FLOORED ATTIC STORAGE.